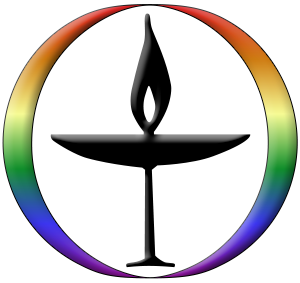 The Unitarian Universalist denomination holds as a guiding principle the inherent worth and dignity of all people—all lives matter. Many of us also recognize that despite the stirring articulation of this ideal in the Declaration of Independence, our nation has never fully honored it in our dealings with all of our citizens. Americans of European decent tend to take for granted inherited privileges not always accorded to citizens with family origins in other parts of the world. Americans with an African heritage and Native Americans have a particularly long history of exclusion and abuse. The principals of our denomination and of our nation call us to address this inequity. To show our support for the BLM’s call for equality, the UUSO congregation approved hanging a banner at a special meeting Feb. 28. 2016. It was installed over the Chapin Memorial entrance on May 1, 2016. Recognizing that we needed to do much more, the congregation also voted to work to become an anti-racist congregation. We changed the name of the task force to the Anti-racism Task Force and charged it with continuing to provide educational opportunities to help us in the effort to eradicate racial bias in ourselves and in the world. To this end, the task force regularly hosts anti-racism discussions, collects and shares reading and video materials, and keeps the congregation informed about relevant activities. Watch this web page for suggested readings, event listings, and internet links. The Anti–Racism Task Force is sponsoring the following opportunities to deepen our understanding of race and its effect in our culture on our lives. Sunday, January 8, 12:30pm, Robing Room downstairs in Chapin: Donna Behrendt will facilitate a discussion of Whistling Vivaldi, a study of stereotyping and how it effects the way we view one another. Even if you haven’t read the book please come and be apart of the conversation. Sunday, January 22, 12:15pm, in the sanctuary: Alice Siegfried and Zanna McKay will screen the short film “Class Divided” and facilitate a discussion of the effects of granting privileges based upon differences. Please join us and be a part of the conversation.